Chittenden, 158,501 (2012); Windsor, 971 sq mi. Historic sites feature the people and places of the American Revolution; fascinating museums as well as art and theater & music venues help offset the abundant outdoor and winter activities. Shopping in country stores, galleries, museum stores, or at sprawling outlet communities is welcomed and encouraged. At day's start or day's end, native refreshments include maple syrup, apples, cheese, and chocolate. If you need a little help finding something to do, checkout our Calendar of Events. The beauty of Vermont ranges from rustic to refined, and it all feels special to the Vermont way of life. Vermont remains a superb destination for country drives, mountain rambles, and overnights at country inns. A good map opens the door to back-road adventures, and it's not hard to get a taste of Vermont's way of life. The numbers tell the story: Burlington, Vermont's largest city, counts around 39,000 year-round residents; Rutland sits at around 17,000; Montpelier, the state capital, about 8,000; Brattleboro and Bennington, perhaps 8,500 and 9,500; Stowe and Manchester have between 4,000 and 5,000 residents; Woodstock and Chester about 3,000. The state's total population is just a shade over 600,000, making it one of only a handful of states with more senators (2) than representatives (1) in Congress. We are planning a trip to Vermont - Can you send me brochures/maps? A few more pages that may help you in planning your vacation online are our Lodging, Dining, and Attractions pages. When viewing these pages, you can sort by the region you will be visiting with the map in the upper left-hand corner. Our "Guide to Vermont Weddings & Civil Marriage" should be able to answer all your questions. If you have more questions, contact your Town Clerk or the Vital Records Unit of the Vermont Department of Health at 802-863-7275 / 800-439-5008. When contacting them, please mention you found their information on VERMONT.COM. The first European known to have entered the area that is now Vermont was Samuel de Champlain, who, after beginning the colonization of Quebec, journeyed south with a Huron war party in 1609 to the beautiful lake to which he gave his name. The French did not attempt any permanent settlement until 1666, when they built a fort and a shrine to Ste Anne on the Isle La Motte in Lake Champlain. However, this and later French settlements were abandoned, and until well into the 18th cent. the region was something of a no-man's-land. At the beginning of the Revolution, Ethan Allen and the Green Mountain Boys captured Ticonderoga, and Seth Warner took Crown Point. In Jan., 1777, Vermont (as its citizens were soon calling the region) proclaimed itself an independent state at a meeting in the town of Westminster. 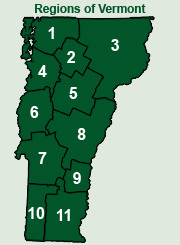 Chiefly because of the opposition of New York, the Continental Congress refused to recognize Vermont as the 14th colony or state. The convention that met at Windsor in July reaffirmed Vermont's independent status and adopted a constitution, notable especially because it was the first in the United States to provide for universal male suffrage. Thomas Chittenden was elected the first governor. The Green Mountain Boys under Seth Warner and John Stark made an important contribution to the American cause with their victory at Bennington in Aug., 1777 (see Saratoga campaign). Later, Ethan Allen and his brother Ira Allen, acting on their own, entered into devious negotiations with British agents, possibly with the intent of annexing Vermont to Canada. The talks were inconclusive and ended when the Americans finally triumphed at Yorktown in 1781. For ten years Vermont remained an independent state, performing all the offices of a sovereign government (such as coining money, setting up post offices, naturalizing new citizens, and appointing ambassadors) and gradually becoming more and more independent. Not until 1791, after many delays and misunderstandings and, most important, after the dispute with New York was finally adjusted (1790) by payment of $30,000, did Vermont enter the Union. It was the first state to be admitted after the adoption of the Constitution by the 13 original states. 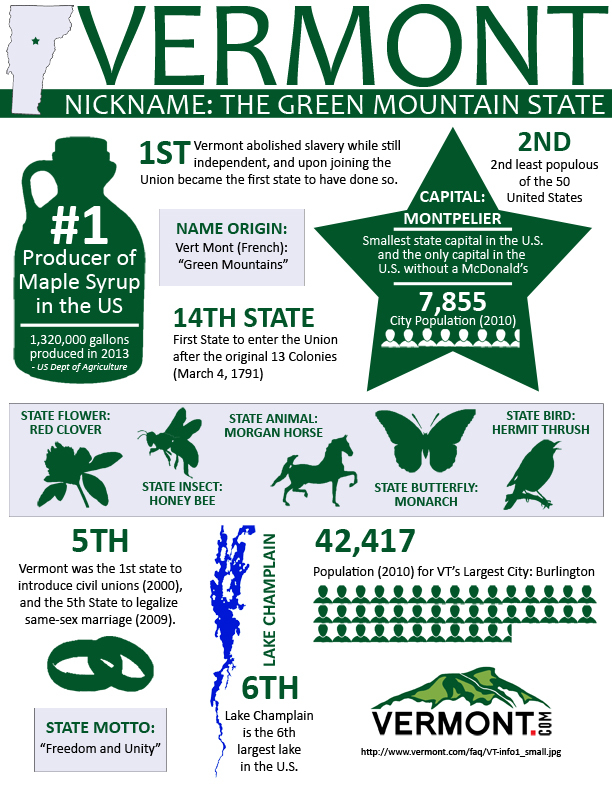 In the next two decades Vermont had the greatest population increase in its history, from 85,425 in 1790 to 217,895 in 1810. As in the earlier days, most of the settlers migrated from S New England, and, since the more desirable lands in the river valleys were soon taken, many of them settled in the less hospitable hills. Although the Embargo Act of 1807 aided the development of many small manufacturing establishments, it was bitterly opposed in Vermont for its disruption of the profitable trade with Canada. The War of 1812 was unpopular in Vermont as it was in the rest of New England, and during the war extensive smuggling across the Canadian border was carried on. Vermont was threatened by British invasion from Canada until U.S. troops, under Thomas Macdonough, won (1814) the battle on Lake Champlain. At this early period in its history, Vermont, lacking an aristocracy of wealth, was the most democratic state in New England. Jeffersonian Democrats held control for most of the first quarter of the 19th cent. Beginning in the 1820s political and social life in Vermont was considerably affected by the activities of those opposed to Freemasonry, and in the presidential election of 1832 Vermont was the only state carried by William Wirt, candidate of the Anti-Masonic party. Anti-Masonry agitation was soon succeeded by even more vigorous efforts in behalf of another cause—the one against slavery. In the Mexican War, which it viewed as having been undertaken solely to increase slave territory, Vermont was very apathetic. However, no Northern state was more energetic in support of the Union cause in the Civil War, and Vermonters strongly favored Lincoln over Vermont-born Stephen Douglas. One of the most bizarre incidents of the war was the Confederate raid (1864) on Saint Albans, a town which, after the war, also figured in the equally bizarre attempt of the Fenians to invade Canada in the cause of Irish independence. The economy of the state, meanwhile, was in the midst of a series of sharp dislocations. The rise of manufacturing in towns and villages during the early 19th cent. had created a demand for foodstuffs for the nonfarming population. Consequently, commercial farming began to crowd out the subsistence farming that had predominated since the mid-18th cent. Grain and beef cattle became the chief market produce, but when the rapidly expanding West began to supply these commodities more cheaply and when wool textile mills began to spring up in S New England, Vermont turned to sheep raising. After the Civil War, however, the sheep industry, unable to withstand the competition from the American West as well as from Australian, and South American wool, began to diminish. The rural population declined as many farmers migrated westward or turned to the apparently easier life of the cities, and abandoned farms became a common sight. The transition to dairy farming in the 20 years following the war staved off a permanent decline in Vermont's agricultural pursuits. Since the 1960s, Vermont's economy has grown significantly with booms in the tourist industry and in exurban homebuilding and with the attraction of high-technology firms to the Burlington area. In recent years, prosperity has to some degree conflicted with concern for environmental issues. Nonetheless, the state has been active in attempts to preserve its natural beauty, enacting very strict laws regarding industrial pollution and the conservation of natural resources. Visit the Vermont Historical Society.